Ever since the advent of digital photography, more and more people have been taking photographs as a way to document all the moments in their life. Not only are they using regular cameras, but they also using their smart phones, tablets, and any other electronic device that has a built-in capture feature. While taking pictures can be a lot of fund, you may not realize it but all those photos you’ve been taking could be worth. Learning how to make money with photography is one of the simplest ways to turn your hobby into a stream of passive income. All it takes is a little understanding about what people are looking for and what you the artist needs to do. And the best part is that you can conduct all of your business right from the comfort of your own home! There is an entire niche demand out there in the world to quickly find and license photos for purposes of advertising or for their own use. It’s true! Just look at the images of any brochure, product, advertisement, or website. More than likely almost none of them were taken by conventional professional photographers. Instead, they were probably taken by amateurs or semi-professional with a photography hobby, and then licensed as stock photo. A “stock photo” or “micro stock photo” is an image that is taken and then used for multiple purposes. Whereas a magazine may hire a photographer to take specific photos of a model or clothing for one of their features, a stock photo works the opposite. The artist takes the photo (perhaps of a beautiful sunset for example). That photo is then uploaded to a stock photo house who then acts as a broker to potential clients to use that photo. As you can imagine, the photo could get used once, ten times, or possibly thousands of times. That’s where the how to make money aspect comes into play. You the photographer and the stock house receive income each time a client licenses out the image. Depending on the fees and prices negotiated between all the parties involved, you could potentially make some very good residual income. The really great part about this whole strategy is once the image has been uploaded to the stock house, it can get viewed or downloaded by anyone at any time of the day. So theoretically if your portfolio was really good and you had a nice selection of images to choose from, you could wake up one morning with an extra $10, $100, or even +$1,000 in your bank account. The possibilities are there! 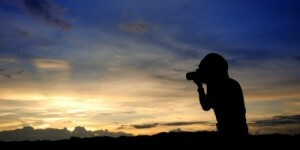 How Do I Get Started in Stock Photography? First things first, you need to have a collection of quality photos that other people would want to use. Although you may think a photo is good or quirky, if a potential client can’t find any use for it, then they will pass. If the photo is out of focus or not well done, then the stock house may reject it before a client ever has the chance to see it. These sites are packed full of good tips and pointers for what kind of photos their clients are looking for, how to take better photos, technical questions, etc. Be sure to compare payout rates and terms. Don’t sign up to be an exclusive contributor unless you’re absolutely sure you only want to license photos from one of these sites. You may find it more profitable to sign up with several and distribute your work through various channels. Before you go wild and upload your entire digital photo library to a stock house for the world to use, there are a few things you should consider first. 1) Not every photo will make the cut. Stock houses are only going to want the best of the best to put in front of their clients. Therefore, the images need to be of the highest quality and have some sort of useful aspects from the perspective of the client; not necessarily because you think it is “good”. 2) Pay attention to copyright agreements. Not all stock houses will offer the same terms for your collection of photography. Make sure before you sign up that you read the fine print and understand what rights you as the artist will retain over the photos. You do not want to get into a situation where you are personally not allowed to use the photo for your own use just because you have uploaded it to the site. Make sure you understand the legalities before you commit. 3) You won’t have control over the image. Say you are a man who uploads a great shot of his beautiful wife. There is nothing to stop an advertiser from then licensing the photo to use in an advertising campaign for breast cancer or domestic abuse. Think of how embarrassing that could be for the two of you! So even though you think you’ve found a great way of how to make money with photography, make sure you only use content that is generic in nature and won’t cause any problems for you no matter how it gets used. 3) What Are Some Great Work From Home Ideas? The post How to Make Money with Photography Stock Images appeared first on Great Passive Income Ideas.